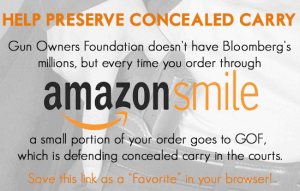 Support Constitutional Carry in the Buckeye State! Urge your state lawmakers to support Constitutional Carry! This year has been a fantastic year for Constitutional Carry. Three states — South Dakota, Oklahoma, and Ohio’s southern neighbor, Kentucky — have all adopted permitless carry. What is Constitutional Carry? It’s the simple principle that you don’t have to ask the government for permission to carry a firearm for self-defense. In fact, states with this firearm freedom are among the safest states in the country. Consider the Constitutional Carry state of Maine, which always ranks near the top in “safe state” rankings. In short, Constitutional Carry would make Ohio safer and freer. Seventeen states are already in the “Constitutional Carry Club,” including Ohio’s neighbors: West Virginia and Kentucky. And thanks to the efforts of pro-gun representative Ron Hood, the Buckeye State could be next with House Bill 178. His bill would allow permitless carry of deadly weapons of 21 years old adults, regardless if they’re a resident of Ohio or not. But gun owners in the Buckeye State need to be vocal for Constitutional Carry to become law. 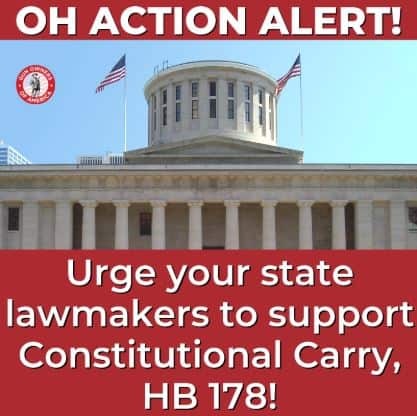 So please urge your state senator and representative above to support Constitutional Carry — HB 178!